Maximum Gun Length (in): 51.000 in. Notes: Includes removable shock absorbing liner. Leading the industry in firearm transport and storage systems, Kolpin Gun Boot 6.0 Impact gun cases are not only the roomiest Gun Boots ever, but they also provide easier access to your rifle with their hinged hatchback design that snaps closed and can be locked. These Impact model gun cases allow ample space for those large scopes and pistol grip style stocks that you prefer to use. They feature removable shock-absorbing foam and a nylon liner for superb protection within the case. 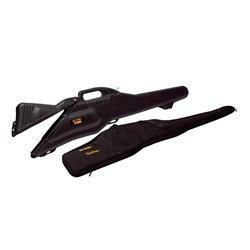 Kolpin Gun Boot 6.0 Impact gun cases sport an ergonomically designed handle with molded attachment points for a sling and the capability of accommodating left or right hand bolt action rifles and shotguns. It is a good boot, could be better but it does the job. It's a lot better than the two piece boots. Pull the pin, raise the lid. Don't have to worry about where to lay the top, if it is raining or muddy. Would recommend to a friend, or buy again. Very good product . Very good service.thank you!